If you look closely, below the two large protruding stones at the top, you can find a tourist and grasp the magnitude of these walls. 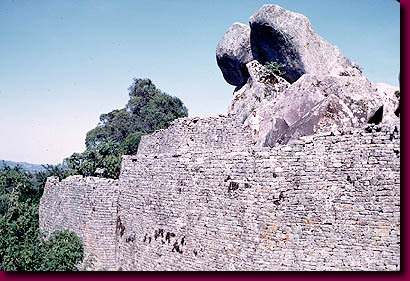 The remarkable ruins of Zimbabwe, located the modern nation which has taken its name for its own, were constructed without mortar. Their visual effect is spellbinding and reminiscent of the stone hand fitted fences of Zacatecas in Mexico.